I've decided to make Tuesdays "Tasty Tuesdays" here at Decor and the Dog. Well, until I don't have my act together. Then it will just be Tuesday. I'm kind of killing it in the kitchen lately. I've been doing a lot of baking/recipe experimenting lately so I figured I'd share. My food photography skills will also amaze you. Try not to be jealous. 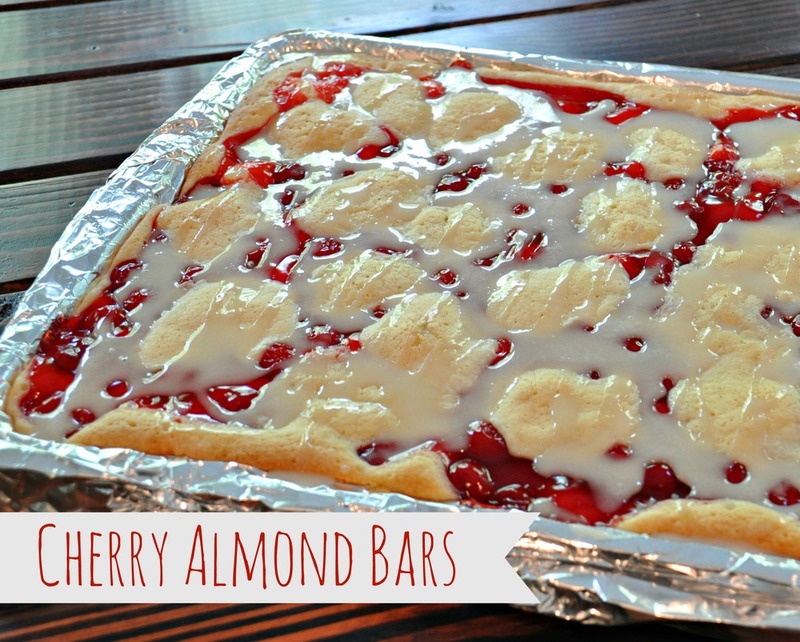 First up on Tasty Tuesdays is a favorite recipe for Cherry Almond Bars. These things are ridiculously good and not super complicated. Slightly messy but I associate messy with tasty. 1. Preheat oven to 350. In a large bowl, cream butter, sugar and salt until light and fluffy. (I repeat it's so fluffy over and over.) Add eggs, beating well after each addition. Beat in extracts. Gradually add flour. 2. Spread 3 cups batter into a greased 15x10x1 inch baking pan. (I lined mine with aluminum foil because I hate cleaning baked good pans.) Spread with pie filling. Drop remaining batter by teaspoonfuls over the filling. Bake 30-35 minutes or until golden brown. Cool completely in pan on a wire rack. 3. In a bowl, mix confectioner's sugar, extracts and milk to reach desired consistency. Drizzle over top. My patience got the best of me and I added the glaze a little too soon so don't be me and actually wait until the bars cool. Also, my mom had a great question. "Do you have to have a blog to link up?" (Seriously. She asked.) You don't! Just upload your pictures to a site like Flickr and link that way!